Stainelec Hydraulic Equipment presents the SEK Tungsten Carbide Hole Cutting range manufactured in Japan. The SEK Tungsten Carbide Hole Saw range feature a patented design to the cutting angle between the configuration of the teeth, resulting in less effort being required when using electric/battery drilling tools. 7 Round Hole Cutter (25mm Long Body); 16, 20, 25 , 32, 38, 40 & 50mm, 1 Plastic Carry Case SEK Fixed Arbor T.C.T. Interchangeable quick change blade sizes available from 19mm to 60mm diameter. Manufactured by CRC, Trefolex is a green coloured active cutting compound containing a dispersal colloid. It melts slowly as frictional heat is generated. It maintains efficient lubrication when applied to the SEK hole saw blades. It is suitable for use on aluminum, mild steel and stainless steel material. 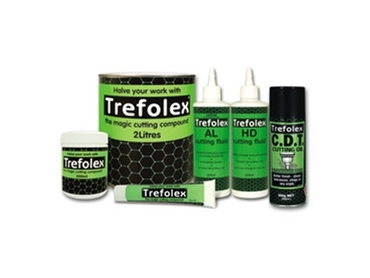 Trefolex prolongs the life of the cutting teeth whilst not affecting the material its cutting when applied. It will not corrode steel nor affect aluminium. Stainelec Hydraulic Equipment presents the SEK tungsten carbide hole cutters manufactured in Japan. Stainelec is the sole Australian agent for SEK Co. Ltd, supplier of precision cutting tools to the metal working industry. The high quality SEK tungsten carbide hole cutters feature a patented design to the cutting angle between teeth configuration, resulting in less effort being required when using electric/ battery drilling tools. The outer and inner cutting tip edges are designed to enhance the discharge of chips, resulting in a smooth and efficient operation.